EDIT: Forgot to include the cutie mark itself! A friend of mine has a habit of buying me stuff and I've never paid him back! 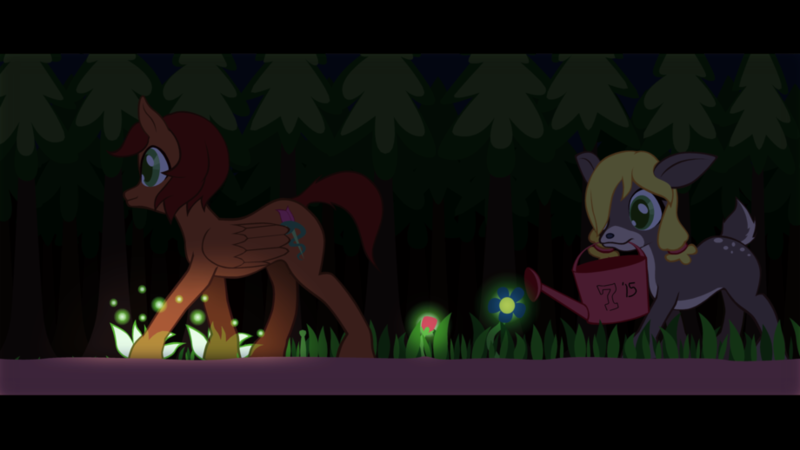 So I've done this gift art of his pony OCs, Sundried Tomato (pegasus) and Honey Drop (deer.) Technically one of our other buds made Honey Drop but meh. Sundried has fancy lifey-wifey nature magic and, despite his being a teenager or so, Honey Drop is his adopted daughter. It's complicated. Let's not get into it just right now. The real question is...what are Sunny and Honey doing out so late on a school night? I don't go to school anymore, and Honey gave me the bambi eyes until I gave in.